​just minutes to Charley Young Beach! Dreaming of Hawaii? Please consider staying at our lovely vacation condominium in sunny, South Maui. 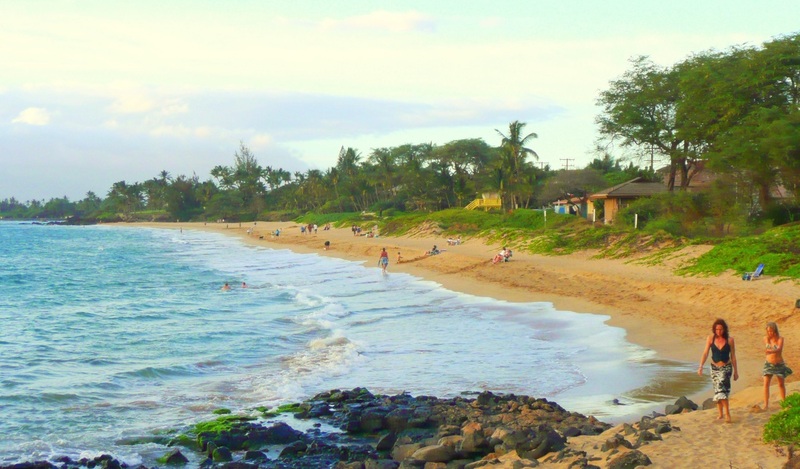 Located right across the street from Kamaole I beach, AKA Charley Young Beach, one of the best beaches on all of Maui. Remodeled and updated in 2007, including a new air conditioner, new paint, all new furniture, 2 quiet and VERY efficient ceiling fans, a flat screen TV with digital cable, and comfortable island decor. BRAND NEW KING SIZE BED ADDED IN APRIL 2010, new sofa bed in 2011, etc. Many of the prints hanging throughout were taken by us, and show the incredible beauty that surrounds us on Maui. Go explore and find YOUR paradise! We have also provided digital phone service which allows you to not only make unlimited local calls, but you can also call anywhere in Hawaii, the Mainland US and Canada for free! YES, FREE!! For all other calls, please use your personal credit card. There is also unlimited high speed Wi-Fi internet, so feel free to spend a little time working or surfing the web while you are here. (computer not provided). The lanai looks over a grassy courtyard area, and the unit is just far enough away from the pool to not have noise, but be very convenient. The best thing about being in Building 1, though, is the beach access! It just can't be any easier to get to the beach. You don't even have to drive! Grab your towel, walk out the door, across the street, down a short path, and you are there! No worrying about what you can and can't safely leave in your car. No worrying about your purse sitting on your beach chair while you are in the ocean. Hungry? Thirsty? Need a break? A short walk (and I do mean short) and you are back in your room.